So I have been at University for three weeks now, meaning my University bag is starting to fill up with all the most random little bits and bobs which I pick up and throw in there! I usually end up with chewing gum wrappers, random bits of blue tack and paper clips all in the bottom of my bag but this academic year is a new year and I'm making some changes! I will keep my University bag clean and tidy even if it kills me. 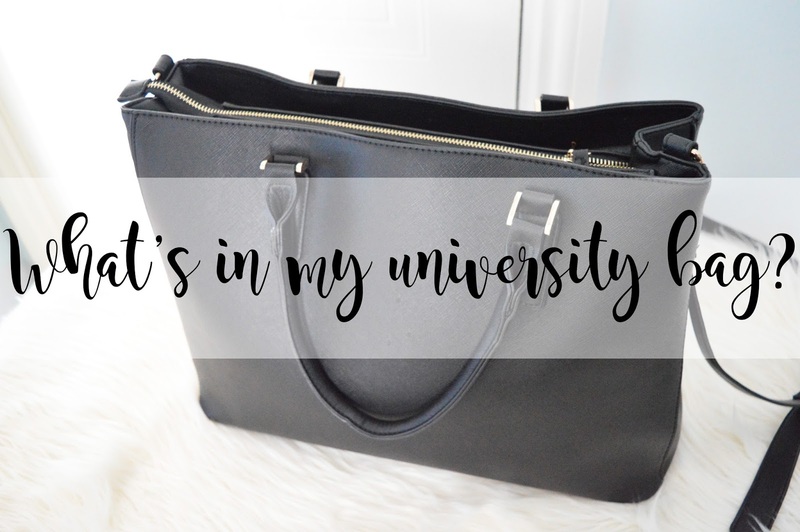 I thought it would be a lovely touch to my blog to show you all the random rubbish in my University bag, as I loved creating my "What in my bag" post back in the summer. So this is my bag which I recently purchased from Aldi, can you believe it; Aldi! I picked this up for just £20 and the quality of it is incredible! It's a thick faux leather, but it's a high quality faux leather too! It's very sturdy and compared to some of the cheap bags out there, I know the handles off this bag aren't going to snap off when I have too much in the bag! I mean, they probably will eventually from over use but not just yet they won't! The one aspect I absolutely fell in love with about this bag is the fact it has a zip to keep the whole bag secure. Unfortunately with a lot of bags which are out at the moment, they include a lot of large pockets in the inside, but there isn't a zip at the top to stop the contents from getting wet. However, because this bag was classed as a "Ladies laptop handbag", it includes the zip at the top for security and to keep the bag waterproof, which is what I have been looking for when searching for a bag for University. As you can see from the picture above, the bag includes a fair few pockets which is perfect for separating everything which you take to university! This bag is fairly large, but not too big (it's not quite like a suitcase), but it does remind me of a Mary Poppins bag as you can fit so much into it! I love being able to have a bag which I can either hold in my hand, on my arm or on my shoulder and this does the job! It has a sturdy shoulder strap which is long enough to wrap across your body, or two thick, high quality handles to hold in your hand if you need to give your shoulders a rest! First things first, in one pocket I include my A4 note pad which I take notes in when in my lectures, it's great because it's light weight, and not as bulky as the refill pads which I also love! (I tend to use these at home). But you can also tare out pages neatly as they include the lines to rip on! Life saver. I also have my University diary and my general life diary. I have a post coming soon on how to juggle university, blogging and life where I mention the use of diaries, so make sure to look out for that post! Obviously, stationery is a huge essential when studying at University so I have this pencil case which I picked up at Tesco when I was in school, so 3-4 years ago. Unfortunately, you probably won't be able to purchase this now! In the other large pocket I carry around three wallets which are for both of the modules which I am currently studying and the third is fore my placement documents which I take into the school. I label these so I know which wallet is for each module and I love being able to colour-code these to my ring binders which I leave at home! These save carrying around my ring binders to and from University, and it's a way of storing all of your important handouts without them getting wet when it rains! Especially if you do not have the zip at the top of your university bag. I currently have the EYFS file in my bag too as this is a key document which I always need to refer to in my writing so it's useful just to slip into my bag and leave there for when I need it! I very rarely wear my glasses as they're mainly for when I have a headache or need to wear them when concentrating on my laptop, phone or watching tv to block out the bad UV. However, I carry these round with me just in case I ever need them. I love this bag even more for the amount of small pockets which are on the side of the bag! They come in handy for little bits and bobs which are essential that I can keep out of my pencil case for easy access. I like to keep a small stapler and staples in my bag for all of the handouts which we are given throughout lectures. However, I also like to use paperclips so after receiving this tiny pot of paperclips at freshers, they were instantly thrown into my bag! I am also fairly OCD when it comes to how my notes look. Even though they're just notes, I cannot have a crossing out on my page so this is when Tipp-Ex comes into place to ensure I have a neat page of notes which no crossing outs or doodles on! I'm strange, I know! Pens are my weakness, I love the way too much and I have too many! But, they're handy and I'm always misplacing them so I keep my favourites in the easy access pocket at the side of my bag. My favourite make of pens are BiC and Paper Mate. Last but not least, I also have two of my favourite lip balms as it's Autumn, it's cold and my lips are always dry and chapped! In the centre pocket of my bag I carry my University USB stick which contains every document for University which I will ever need. I also used this for college so it also contains all of my college work which can sometimes come in handy for certain topics at University! I also have my student cards for when I visit the library or if we ever need to use them for anything else (which is very rarely) but it's best to have them than not to have them at all! This is what the bag looks like empty. It has a large pocket on either side, as well as a large zipped pocket in the centre. As well as this, there is a medium size pocket on one side which is padded for a laptop to be in! I haven't put my laptop into this yet, as I can imagine my bag will end up ridiculously heavy! But, I will eventually get round to using it! On the other side of the bag there is smaller pockets which is where I keep all of my little bits and pieces which I always need to grab quickly. Here is a close up of the smaller pockets. As you can see, there is a large zipped pocket and I mean, this is the largest "small" pocket I've ever seen in a bag! There is two smaller pockets on the left, and then 3 pockets for pens. On the right side underneath the zipped pocket there is a medium pocket, and then a smaller pocket underneath that. I have never had a bag which has this many pockets but that's what I love most about it! For only £20, you just can't go wrong with it! Do you include loads of random bits and bobs in your University bag? Now I am going to go give my bag a good tidy and organise... thank you for the motivation!! haha! Love that bag too, perfect size not to big not too small. I love this post, I'm so nosy so I love having a little insight into how people pack their bags for uni! Your bag looks much like my own- only much neater and more organised.